When this gutsy painter partners Clé de Peau Beauté, a highly coveted collection is born. Ashley Longshore is hardly the person you’ll meet and soon forget. And even if you do somehow forget that you’ve met her, you get the feeling she’s the kind of person you can trust to crack a joke about it and laugh along with you, not at you. That’s just who she is—loud, passionate, energetic, and super grounded. “I’m from the south and I wear it proud,” she says of her American lineage. Check out the hilarious Boomerangs and wacky poses on her Instagram (@ashleylongshoreart) and you’ll understand what we mean. 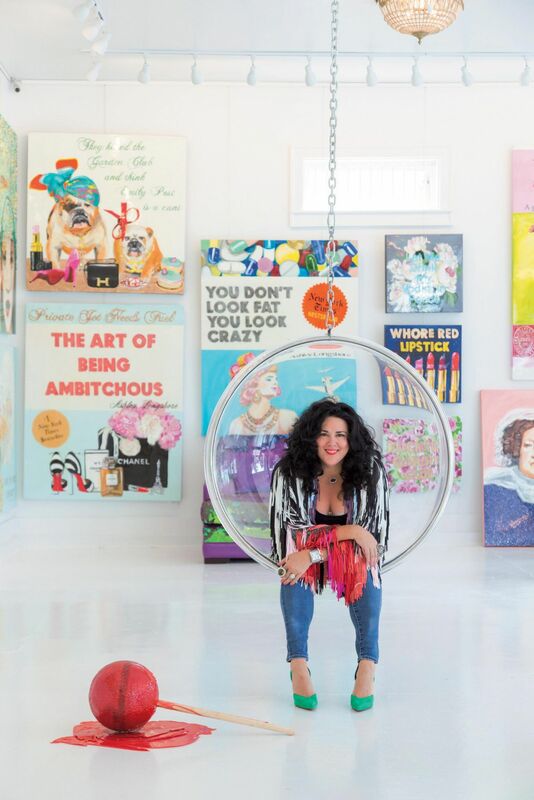 The New Orleans-based artist is known just as well for her pop art pieces as she is for her sense of humour. Her larger-than-life persona is often mirrored in her pop cult artwork; fashion royalties such as Anna Wintour, Kate Moss and Karl Lagerfeld aren’t spared. Naturally, when Clé de Peau Beauté went around shopping for an artist that represents the modern woman of today, to breathe life into its 1920s inspired holiday collection titled Les Années Folles and the woman of that era, they knocked on her door. How does vibrant pop art and timeless beauty come together for this holiday collection? Ashley Longshore There are two sides to me; I think most women do. One side of me is rebellious and curious about where I stand in the world—in terms of status and power. The other part of me celebrates the strength, beauty and fearlessness of women through my work. I think when Clé de Peau Beauté saw my celebration of women’s beauty, they knew that combining my creative efforts with the 1920s art deco theme and colour palette chosen by [Clé de Peau Beauté make-up creative director] Lucia Pieroni would create a glamorous packaging that represents the essence of the brand. Together, we encapsulate the spirit of the confident and beautiful customers of this collection. How different are women now as compared to the ’20s? AL Women certainly didn’t have the same opportunities as we do now. The modern world is embracing the fact that females, just like males, have a lot to contribute to the society. Back then, I would imagine that fashion was such a huge statement for women partly because it was the only thing that women had—those glamorous and fashionable moments. Now, we enjoy fashion but we also have the ability to go out and make our own money and do our own businesses. How would you describe the Clé de Peau Beauté woman? AL She’s very sophisticated. She demands the highest quality when it comes to beauty. She’s also modern, elegant. My designs reflect this side of her. Is creating art on canvases very different to designing packaging? AL My canvases are larger than the make-up cases so I had to think about the amount of time needed as well as how my drawings would translate the collection’s inspiration. It’s challenging to doodle on a smaller area but through this partnership, I’ve learned so much more about product packaging. Ultimately, the boxes are designed to look minimal yet glamorous. Where do you usually draw your inspirations from? AL I frequently travel around the world, which is important because I never know when I’ll be inspired. One thing’s for sure: if I were to just stay in one place, I’m never going to grow. This is much like if you wore the same outfit or lip colour every day—nothing changes. It opens up life’s vast possibilities. AL Yes. I love finding and experiencing new things in life. It constantly pushes me to grow and that’s what is so wonderful about this collaboration because I’ve never really painted anything related to art deco before. I’ve also never created product packaging before. Even though I wasn’t absolutely certain of what I was doing initially, I’ve always told myself to keep learning. If I stay a “student”, there’s no need to worry about the lack of inspiration. AL I’ve been busy with my home collection which includes giant chairs that are beaded and bedazzled—just like my paintings. There are also rugs with elements from my drawings and giant mirrors. At the same time, I’m working on my book You Don’t Look Fat, You Look Crazy; it will come out in spring of 2017. It documents my journey as an artist [so far], and it tells on the good and bad times. I want it to be as real and honest as possible.